Serve appetizers with a side of style with these glossy arches. Serve appetizers with a side of style with these glossy arches, inspired by the handy catering trick of using watermelon rinds for serving quick bites. Toothpick holes take the guesswork out of creating artful arrangements, while a clean ceramic plate spears the goods without the inevitable sogginess of end-of-party rinds. Four piece set: Three arches, one dish for discarded toothpicks. Large arch features 20 toothpick holes, medium contains 16 holes and small features 10 holes. Includes 50 wooden toothpicks. Designed by Elan McPherson. Handmade in Washington State. Some passions manifest themselves early on. Such was the case for Elan McPherson, who from childhood could be found experimenting with both pottery and entrepreneurship. “I painted rocks and made rock men and would then sell them on the most rural road you can imagine,” she recalls. Except the limited capacity, it is a very stylish and well made appetizer set. Great for parties and special occasions. A great gift for someone who entertains! I just received my set and inspected it before I wrap it up as a gift. 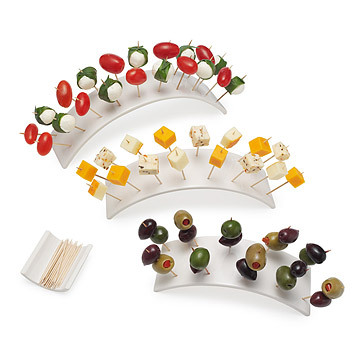 The set itself is sturdy, sleek, and will be a wonderful addition to my Mother's regular hors d'oeuvres displays. I am also very pleased with the packaging- the box is colorful, clearly identifies what is inside, and holds the set very nicely; I will not need to do any additional explaining as to what the set is used for. I am very happy with my purchase. Nice idea, but when you open the box, you can't really tell what it is. The packaging design seems it's like for a child's gift. Love this rainbow display. I've been eyeing it for awhile and glad I purchased it. One toothpick hole not bored through so would NOT take a toothpick! Thank goodness it was on the end of the rainbow so hopefully wasn't noticed by guests. Considered sending back, but handicapped and hard to repackage, go to Post Office etc. but very disappointed. Suggest inspecting before shipping. Added so much color to the table. A conversation piece with guests. Had tried to purchase from another source but was out of stock and $20 higher. Your catalogue CAME THAT DAY! Saved me! Shipping didn't come as promised. (2 to 3 days which I paid extra for). Came in one week,so it missed useage at one of my earlier parties for Chinese New Year. Very disappointing. Our friends often have us over for dinner and we thought this would be the perfect hostess gift! now getting one for myself too!